A pregnant North Texas woman being kept on life support against her family's wishes is stirring political debate in a state immersed in competitive primary races. A pregnant North Texas woman being kept on life support against her family's wishes is stirring political debate in a state immersed in competitive primary races, and fresh off a legislative session in which lawmakers had tense debates over when life begins and how it can end. At 14 weeks pregnant in November, Marlise Muñoz, 33, suffered what doctors believe was a pulmonary embolism. She was nearly dead when her husband, paramedic Erick Muñoz, found her collapsed in their home. Although Erick Muñoz and Marlise Muñoz's family wanted to honor her desire not to be placed on life support, more than a month later, doctors are still keeping her alive at John Peter Smith Hospital in Fort Worth. The hospital can detect a fetal heartbeat, but the health and viability of the fetus are unknown. The Muñoz family’s case has received national attention, and prompted some Texas lawmakers to question the state’s law. State Rep. Jessica Farrar, D-Houston, the chairwoman of the Women’s Health Caucus, said she expects lawmakers to take up the issue next legislative session. Attorney General Greg Abbott, who is running for the Republican nod for governor, declined to give his opinion on the case, offering an explanation he has repeated often when asked to weigh in on contentious issues. State Sen. Wendy Davis, D-Fort Worth, whose run for governor was largely propelled by her filibuster of the state's tough new restrictions on abortion, called the case "an incredibly tragic situation and an intensely private matter for the family." "This private decision should be made by Mrs. Muñoz’s family, in consultation with her doctors," she said. Among the Republican candidates for lieutenant governor, incumbent David Dewhurst was the only one to weigh in on the case, saying that one life has already been lost and it "would be tragic to lose another." "In the midst of this debate, we cannot lose sight of the fact that we're talking about a baby who deserves the full protection of the law," he said. "I grieve with the Muñoz family and pray that God moves through this tragedy to bring healing and new life." 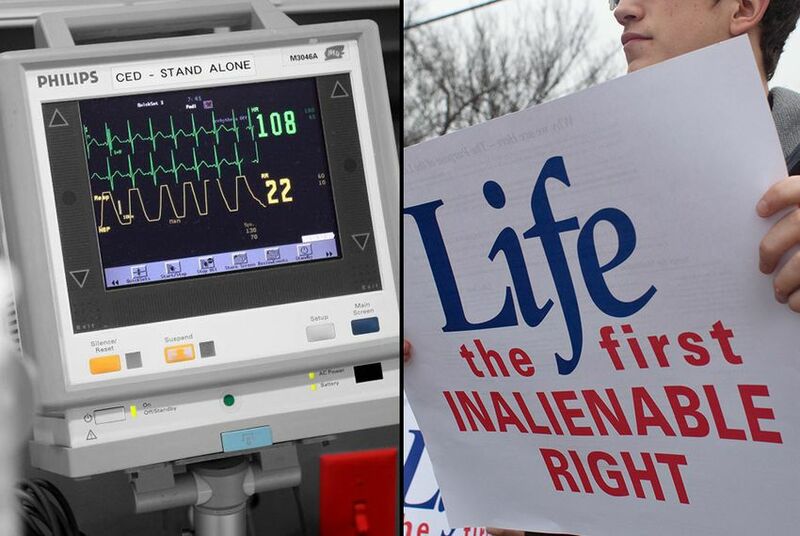 Although abortion opponents had landmark success in Texas’ 83rd legislative session, a divide between lawmakers and organizations that describe themselves as “pro life” over how to legislate end-of-life care has carried over into the 2014 election cycle. In January, the Texas Catholic Conference and some lawmakers criticized Texas Right to Life’s scorecard, which heavily penalized lawmakers — even those who voted for strict abortion regulations — for supporting legislation to change Texas' advance directive law that the organization did not endorse. Rep. Donna Howard, D-Austin, said the lack of agreement on how the state should handle end-of-life issues in the last legislative session is evidence enough that the state’s role in legislating those types of decisions should be limited. Complicating this case, Howard said, is the fact that Marlise Muñoz would have had a constitutional right to terminate her pregnancy because she was fewer than 14 weeks pregnant when the hospital put her on life support. “That right is being denied even though her husband is in a position to speak on her behalf,” Howard said. John Peter Smith Hospital cannot verify whether Marlise Muñoz is brain dead, Labbe said, because patient privacy laws prohibit the hospital from commenting on her condition, and the family has not signed privacy waiver forms. Melissa Conway, a spokeswoman for Texas Right to Life, said in an email that the term “brain dead” is often misused. The criteria to determine whether a patient is brain dead varies, Conway said. Based on the information available, her organization believes Marlise Muñoz’s brain is still functioning enough to support the growth of the fetus. “Texas Right to Life prays for the Muñoz family and that they choose life for both patients during this very difficult time,” she said. Jeffrey Patterson, executive director of the Texas Catholic Conference, which represents the policy interests of the 15 Roman Catholic bishops in Texas, said nothing's unclear about the law, and that the Legislature surely intended to protect the life of a child if this type of circumstance arose. “The state has the right and the interest to protect the life of the child,” he said.